Social Media Star Jerome Jarre Has A 'Crazy Idea' To Help Somalia. Will It Work? : Goats and Soda Jerome Jarre wanted to raise $1 million, buy 60 tons of food and get Turkish Airlines to fly it in for free. How's he doing? 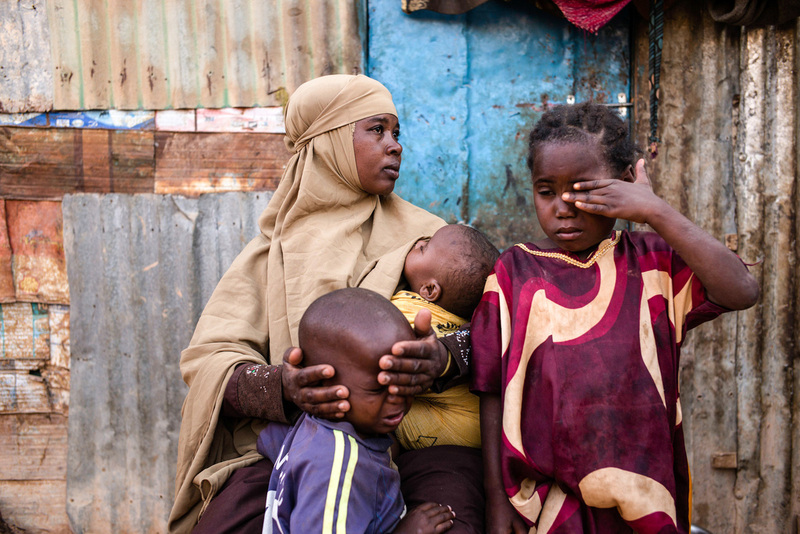 Fatun Mohamed Sareye, 30, sits with her family at a camp for internally displaced people in Garowe, Somalia. A viral social media campaign to fight the looming famine in Somalia has already raised more than $2 million. The goal is to send 60 tons of food to the country. But as the campaign has unfolded, it's become clear that it's still a work in progress. With the distribution set for March 27, some critical details are changing or not yet available. The unlikely man behind the plan is French social media celebrity Jerome Jarre (who had 8 million followers on Vine and is now on Snapchat). In a video he posted on social media platforms on March 15, he says he got the idea for the campaign after a volunteer in Somalia called him on the phone to recount watching a 6-year-old girl die from dehydration. As he put it, "The movement started with a crazy idea, what if we could convince Turkish Airlines to let us use one of their flights to Somalia? And fill it with food!" Jarre challenged viewers to post on social media with #TurkishAirlinesHelpSomalia to lobby Turkish Airlines, the only commercial airline he could find that flies to Somalia, to donate a cargo plane for a onetime food delivery. The campaign began to attract other celebrities, including actor Ben Stiller and former 49ers quarterback Colin Kaepernick, who boosted publicity and donated their own money. Along with Jerome, they formed a crowd-funded campaign on GoFundMe and called it "Love Army For Somalia." Stiller's foundation is accepting donations for the cause so they are tax deductible. Filmmaker Casey Niestat created a video to document the money-raising efforts, which was published on March 17 and is now at 3 million pageviews and still trending. Also on the 17th, Turkish airlines responded. We are learning from multiple experienced NGOs that sending tonnes of rice/flour/sugar/oil is not the best thing to do. It can crash the local market price and hurt the small businesses there. Plus babies are not able to eat rice. Instead of buying from Istanbul we will get small NGOs on the ground to buy food directly in Somalia. We will constantly be checking that everything we give to those NGOs is spent on food & water. However, WE HAVE A FULL TURKISH AIRLINES CARGO FLIGHT TO FILL WITH FOOD !!! (woohoo!) So we've decided to use that space (60 Tonnes) to fly special food for malnourished babies. The name of the food is PLUMPY'NUT. The evolving nature of the campaign shows the potential problems with a grassroots humanitarian effort but reveals a trait donors may value just as much as predictability — real-time transparency. And there's a sense of excitement in comments from the donors on the GoFundMe page. "First cause I donated to," says one. "I feel happy." "I decided to give to Somalia, because people are dying, and nobody before Jérôme talked about it, to my knowledge," Déborah Cotillon, a 21-year-old student in Tours, France, tells NPR via Twitter. For her, one of the most attractive aspects of the campaign was that "Jerome promised to be completely transparent about what he does with the money." And the specialists are glad to hear about the campaign's change of plans: "More and more as opposed to flying in goods, we're looking for local areas" to get food, said Paul Spiegel, a professor and the director of the Center for Refugee and Disaster Response at Johns Hopkins. What's more, transport by truck is less costly than by plane and so would be a better long-term model if the Love Army campaign continues. But the source of the food is just one issue. There's also the matter of protecting food before it is handed out so it isn't looted, says Challiss McDonough, a World Food Programme senior regional spokesperson based in Nairobi, Kenya. "We have the strictest regulations for operations in Somalia because we've had to," says McDonough. The lack of infrastructure and potential for government corruption means goods could be stolen by local officials or other community members if not carefully monitored. WFP has its own warehouse where goods are sent as soon as they're delivered to a port in Somalia; permanent staff constantly checks the stock. When transporters vie for contracts with WFP, they must pay a bond used to reimburse the organization if food is not successfully delivered. These precautions, McDonough says, help donors know their money will go to feeding the people most in need. NPR asked parties involved with the Love Army food delivery about such safeguards. A Turkish Airlines spokesperson did not respond to requests for details about who would be present when the plane landed, how food from the plane would be distributed and whether security measures will be set up. A spokesperson for the GoFundMe campaign could not provide these details by midday March 21. Chris Kindler, a spokesperson for the American Refugee Committee, which is partnering with the campaign to organize the food delivery, also didn't know these details as of the 21st and was unable to find someone who did know. As for the decision to go with Plumpy-nut instead of a variety of foods, Spiegel and McDonough say that changes for grassroots aid efforts are par for the course. The explanation for the switch, they say, reflects positively on the campaign because it shows willingness to incorporate the input of reputable NGOs like the American Refugee Committee. Plumpy'nut is a fortified peanut butter paste is a "ready-to-use therapeutic food" that is considered to be beneficial for severely malnourished children. Public health professionals in areas with high rates of malnutrition typically favor distributing the food to feed children 6-24 months old but it is nutritious for older children and adults as well. The unconventional nature of the campaign has been a plus, says McDonough: "This degree of attention [to the Somalian situation] is somewhat unprecedented." But she still sounds a cautionary note: "Security is always something that needs to be considered, regardless of what is being transported." So for the future of the Love Army — led by Jarre, Stiller and others — may depend on the success of its March 27 distribution. And the group clearly doesn't want this to be a one-shot campaign. Its #NominatedForSomalia Challenge asks each donor to approach three friends to donate via social media. 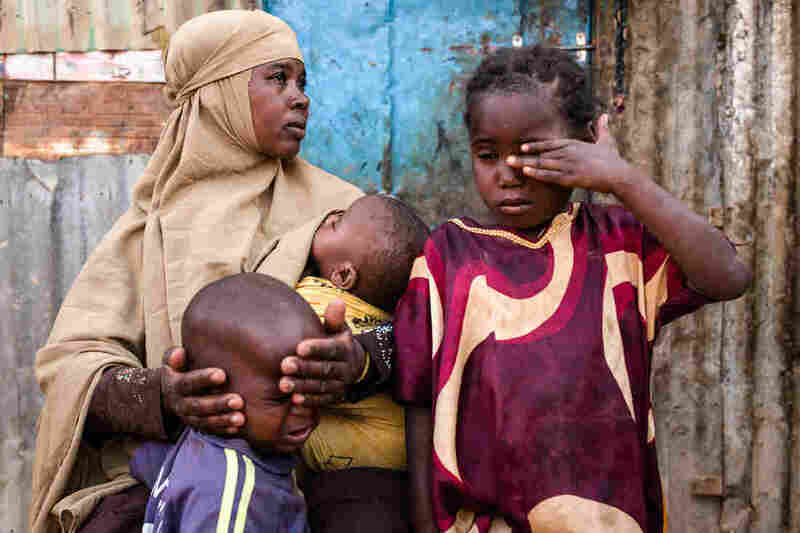 The goal is to come up with permanent solutions to prevent famine in Somalia.